Earlier this month, McCluskey filed a report with university police related to alleged harassment from Rowland. Detectives had been in touch with McCluskey regarding the allegation, according to Brophy, who would not provide further details related to that investigation. Jill McCluskey, Lauren's mother and a professor at Washington State University, released a statement in which she described being on the phone with her daughter at the time of an apparent attack. "Last night a little before 9 p.m., she was returning to her university apartment from her night class and talking to me on the phone," the statement said. "Suddenly, I heard her yell, 'No, no, no!' I thought she might have been in a car accident. That was the last I heard from her." Jill McCluskey's husband, Matt, immediately called 911. Jill McCluskey said Rowland lied to her daughter about his name, age and criminal history. Lauren McCluskey ended the relationship on Oct. 9 after a friend told her about Rowland's criminal history. "Several members of our university administration spoke with Lauren's family last night and I have also reached out to them," Utah president Ruth V. Watkins said in a statement. "Her family is understandably in shock at this news about their daughter. They are heartbroken. We have and continue to offer our full support to them at this terrible time." The university canceled all classes Tuesday. Counseling and support services were made available. A vigil for McCluskey is being planned for Wednesday evening at the Park Building on campus. "This news has shaken not only myself but our entire University of Utah athletics family to its core," athletic director Mark Harlan said in a statement. "We have university counselors and psychologists on standby to support Lauren's teammates, coaches and friends. Our thoughts and prayers go out to her family and all of those dear to her." McCluskey had a 3.75 grade point average and was on track to graduate in May 2019. She was an honor student at Pullman High School and was a state champion in the high jump. "The Pac-12 Conference joins the University of Utah and our entire conference community in mourning the loss of Lauren McCluskey, and expressing our deepest condolences to her family," the Pac-12 said in a statement. 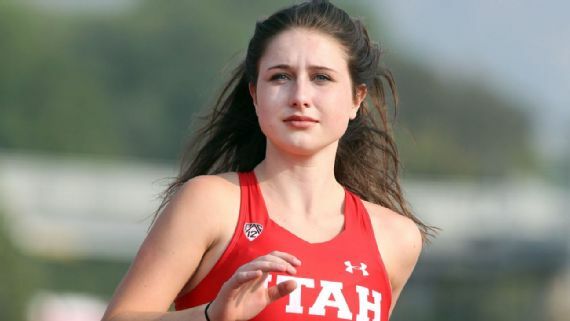 "Lauren was an accomplished and exceptional young woman and student-athlete, and our thoughts are with the University of Utah community and all those who were touched by Lauren as we grieve this tragic loss."